Buloke Shire Council participates in the drumMUSTER program that allows residents to collect and return empty and cleaned farm chemical containers to our Landfills and Transfer station for recycling. 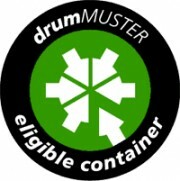 drumMUSTER is the national program that has been set up for the collection and recycling of cleaned eligible non returnable crop production and on-farm animal health chemical containers. As a chemical user, drumMUSTER provides you with a defined route to safely dispose of your used chemical containers. All you are required to do is clean your containers so they are free of any chemical residue then deliver them to one of our landfill or transfer station (except for Watchem and Nandaly). This is a free service and drums can be delivered to the landfills or transfer station on normal operating hours. Drums will be inspected by the site supervisor before they will be accepted and recycled. Only drumMUSTER registered drums are collected (look for the drumMUSTER symbol, above right). Drums must be triple rinsed and free of residue. Lids are to be removed but can also be recycled at the time of delivery.